Trade Show Holograms offers a wide range of large and small 3D hologram projectors for both sale and rental at trade shows, press conferences, corporate gatherings or media events. The smaller hologram exhibits are the most commonly seen as trade show exhibits as they take up a small floor space. When an exhibitor has a adequate floor space and requires a large sized hologram to attract crowds Trade Show Holograms has the solution for that as well. The holographic special effect is a popular attraction in trade show booths in convention centres across the country. 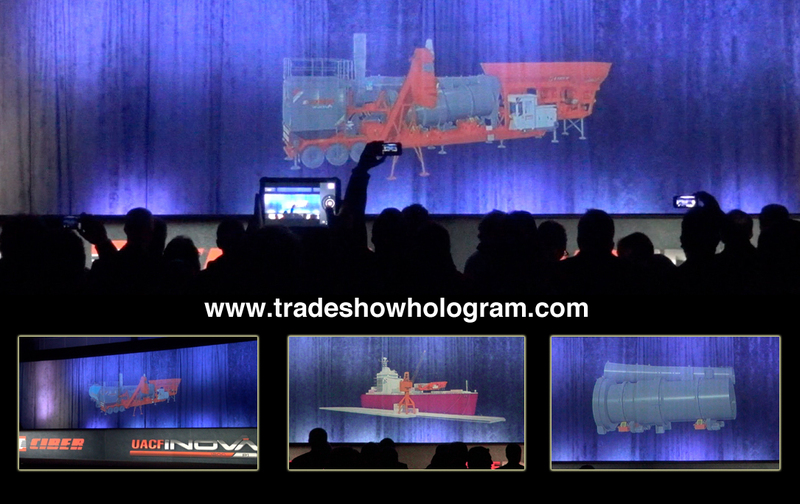 The hologram company recently debuted their largest hologram projector to date. Prior to this model the largest hologram projector the company offered projected an image up to 6 ft high and 10 ft wide. The newest extra large hologram now offers an image size of up to 20 ft wide. Trade Show Holograms has been creating custom Hologram projectors since 2006 when corporate illusionist Timothy Drake created the effect for a trade show in Las Vegas.